The milk producers leave cows on the milking line when they know they have Leukemia, this is causing their industry to fail. The dairy industry is attempting to persuade mothers that children need milk. This has always been untrue. They ought not lie about this. They are reaping what they have sown. Cancer is an epidemic, and the little children who have Leukemia pulls at the heartstrings. But, if they want to help find a cure for cancer, then they ought to follow the research that reveals the connection between the Leukemia in dairy and cancer in humans. A Youtube about milk and meat as a disease vector . According to Raymond W. Sweeney, VMD University of Pennsylvania School of Veterinary Medicine New Bolton Center, it is rare to find a dairy with no cows infected with Bovine Leukemia Virus. See his slide presentation. October 14, 2015. 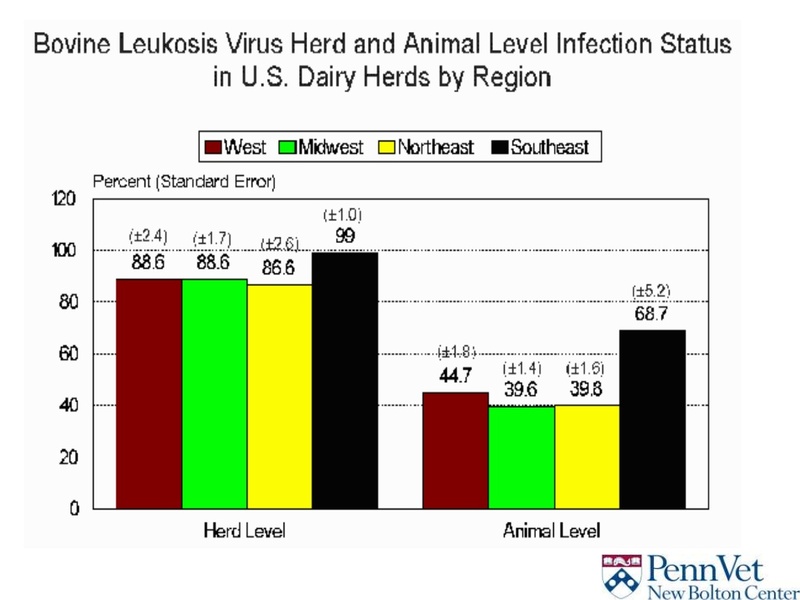 This graph showing % of dairies in US with Leukemia (BLV)infected cows is not an accurate assessment of how much dairy is infected. There are small dairies and large diaries. The number of dairies does not equate with amount of infected milk. Large dairies produce a lot more milk than small dairies. The number of cows infected is not an accurate assessment either. It only takes one cow in a diary to infect all of the milk in the storage tanks. This is a world-wide epidemic in dairy cows. Meat cows are also infected with BLV. This is shown in the slide program. Dr. Sweeney also shows that the virus is transmissible and presents information that indicates it may lead to breast cancer. He states the virus resides in white bloods cells, is lifelong, and has a long incubation period. Think about these truths when putting food with dairy on a church table where others may become infected. More virus's are appearing in meat & milk - even some that survive cooking. is anyone here familiar with Kevin H. Patterson ? We are having a disagreement. :-) He is promoting dark chocolate and vinegar and says that diet has zero impact on the body's ph. An article was published recently by LL where they say that some dairy is good for preventing colorectal cancer. They suggest that for vegans it could be good to consume some. Cheese lovers are loving LL right now. Does a person who does not consume meat, dairy or eggs need supplements, vitamins, meat, dairy and eggs to be healthy ? The results from my blood work came back today. With a protein recommendation of 6.1-8.1 my reading was at the top with 8.0. ( yet with zero meat, dairy or eggs intake). Calcium recommendation is 8.1-10.5; my reading was 9.0. ( That's with zero dairy intake) Glucose recommended range is 74-106; my reading- 85. Nitrogen range is 7-20; mine is -15. Potassium range is 3.5-5.1; mine is 4.6. Carbon Dioxide range is 21-33; mine is- 26. Chloride range is- 99-111; mine reading is -103. Cholestrol range 75-200; mine is 170. Triglycerides range 0-150. Mine -97. VLDL range is 5-40, mine is 19. B12 range- 239-931, mine- 620. The other 30 readings were all in the middle as well. The only thing that was low was vitamin D as in the mountains here there is a lot of cloud cover. I get no innoculations, take no medications or drugs, no supplements , no vitamins, and eat no animal products accept a little honey. I do not get the consistant exercise that I should but needless to say I am pretty happy with the results of my tests. Did the American dairy people get the Bovine Leukemia Virus (BLV) under control? It has gotten worse. A new national study was done in the US last year. The objectives of the current study were to document the prevalence of BLV in a national sample of dairy herds and to provide a basic epidemiologic description of the infection in the US dairy industry. The mean standardized AP of BLV reported here, 46.5%, is higher than previously reported in the US by any other large, multiregion study and is consistent with an ongoing trend of increasing prevalence over the last 5 decades. This finding, together with all the current evidence from the US and other countries with no established BLV control program, points to the prospect of ever increasing BLV prevalence. As the prevalence of BLV increases, the cumulative economic loss associated with infection will also continue to increase, making it a threat to the long-term sustainability of the US dairy industry. Future BLV research should therefore focus on controlling BLV transmission and reducing BLV prevalence. No mention of human breast cancer, only the loss of income to dairy farmers if BLV is not controlled. Some European countries have done eradication programs to eliminate BLV from their herds, but not the US. I just finished reading and article published at a very liberal (apostate "SDA") website teaching that there is a lot of evidence that dairy does not cause most cancers, with the exception of prostate cancer. It is so very sad that so many want to continue using dairy and eggs for food when we were told that "soon" there would be no safety in doing so. And, we have much evidence that Bovine Leukemia Virus does indeed cause cancer. And, we know that it infects a lot of milk in many countries, and it is known to be in dairy cows and they are often left in the dairies to produce infected milk. For over 20 years we have been presenting the evidence in this forum. Take time to read about the subject that you might be an influence for good especially for the little ones whose mothers think they are doing their children good by feeding them milk.